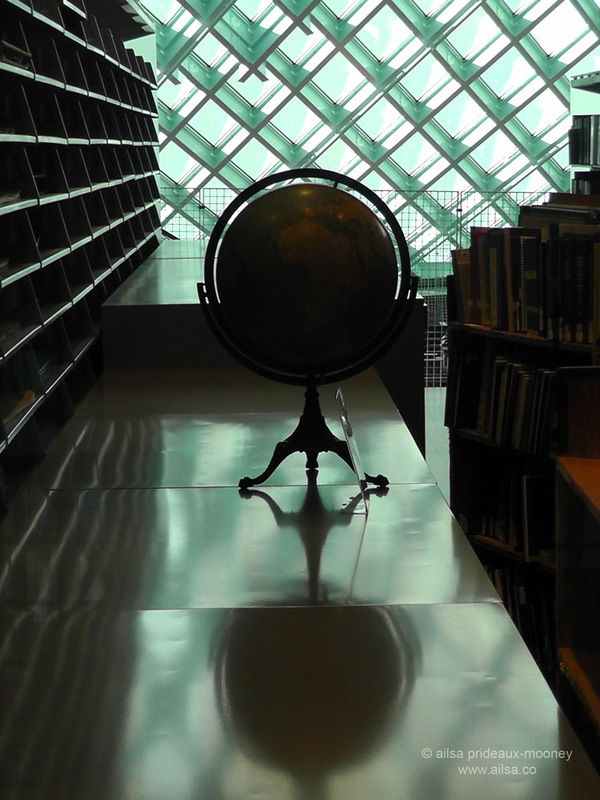 Seattle Central Library | Where's my backpack? 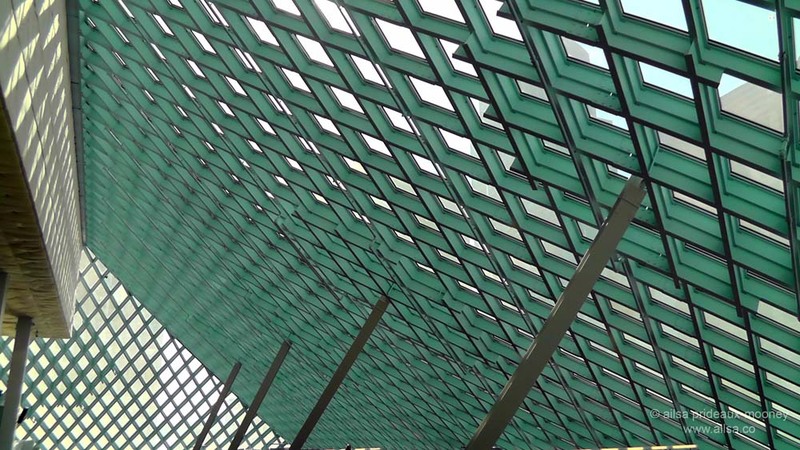 If you’re looking for a free and exhilarating adventure in Seattle, go explore the avant-garde wonder that is Seattle Public Library’s Central Library. Located right in the heart of downtown, between Spring and Madison streets and Fourth and Fifth avenues, it takes up an entire city block and dazzles from the outside like a big chunk of rock candy; its strange, asymmetric concoction of glass and steel reflecting and distorting the images of surrounding buildings into shattered pieces like a jigsaw puzzle. 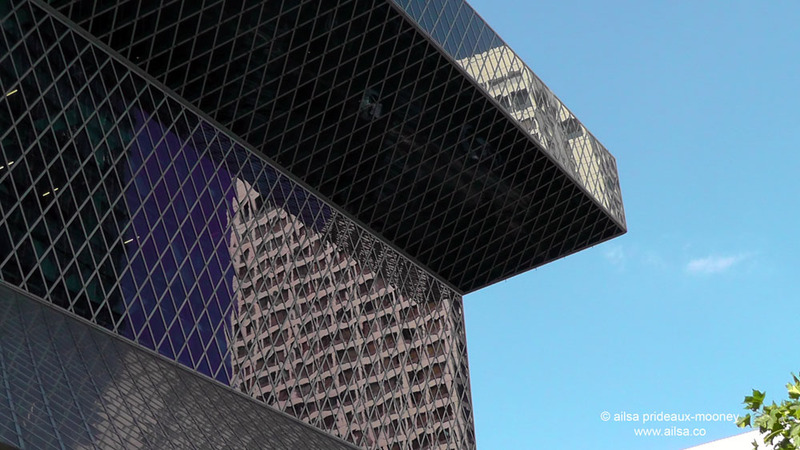 When architect Rem Koolhaas designed the building, he let functionality dictate the form, so the exterior took shape around the interior spaces rather than vice versa. But the exterior is just the tip of the iceberg. Walk inside the doors and you will find yourself immersed in an architectural wonderland of light and colour and texture that will make your spirits soar and your inner child clap its hands in glee. 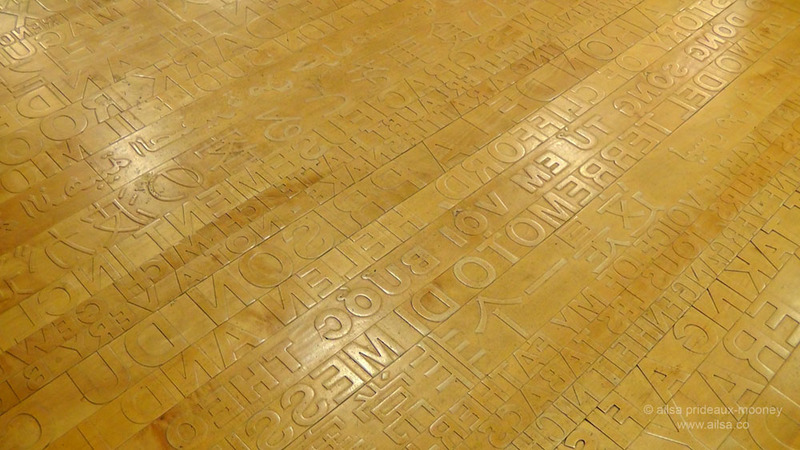 The first thing that catches my eye every time I enter the building is the fantastic Lew Floor, a tongue and groove maple floor created by Ann Hamilton. It is covered in words; they are the first sentences of books in the LEW (Literacy, ESL & World Languages) Collection, in 11 different languages, and they’re inverted; an echo of traditional printing presses. It is also an interesting commentary on the changing form of print culture in this era of e-readers and digital media. Our relationship with the printed word has changed dramatically in recent years. 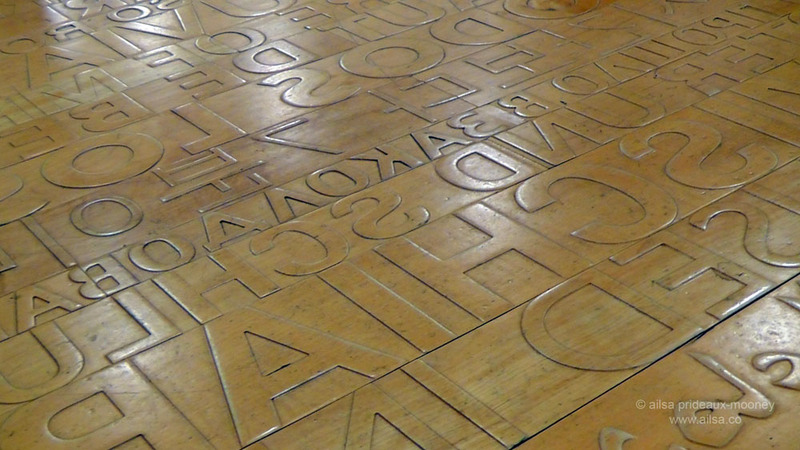 Standing on this floor, surrounded by an ocean of words, I regularly see visitors reach down to run their hands across the raised letters and can’t help but feel that the artist is making an argument for the tactile, visceral joy of reading printed material. 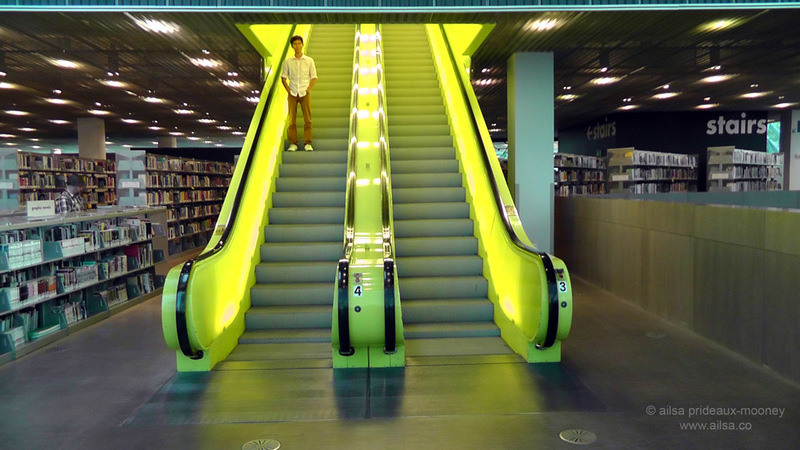 You won’t travel far before discovering one of the library’s gleaming citrus escalators and once you spy them, you will be powerless to resist their lure. 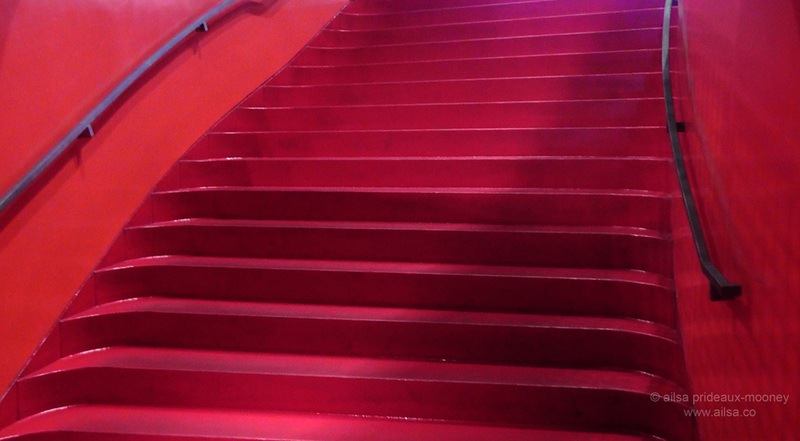 Chances are, you will find yourself going up and down several times, just for the fun of it. 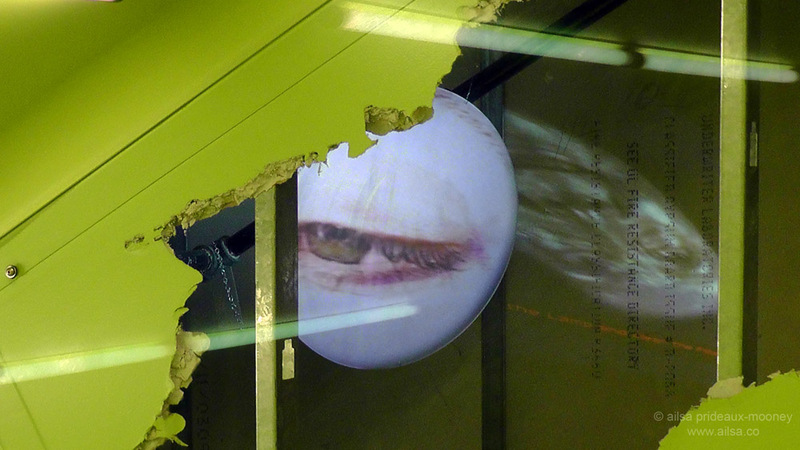 The second glowing escalator has a video installation in the wall. 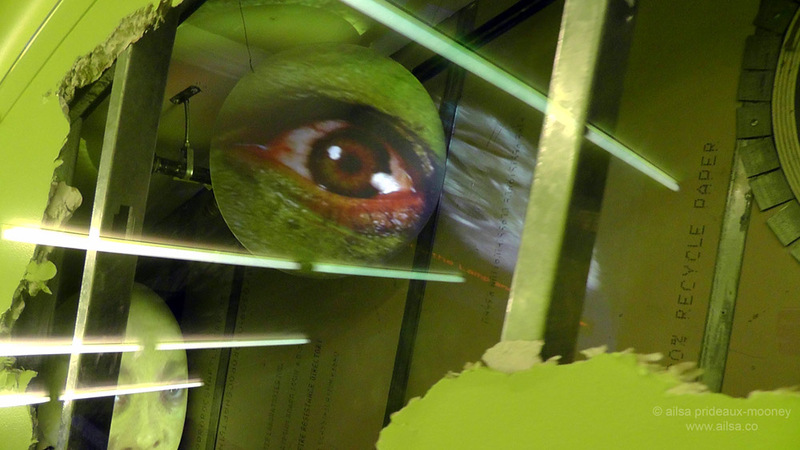 Braincast is the work of artist Tony Oursler and is a study of the library as a disseminator of information in printed, spoken, recorded and digital forms. 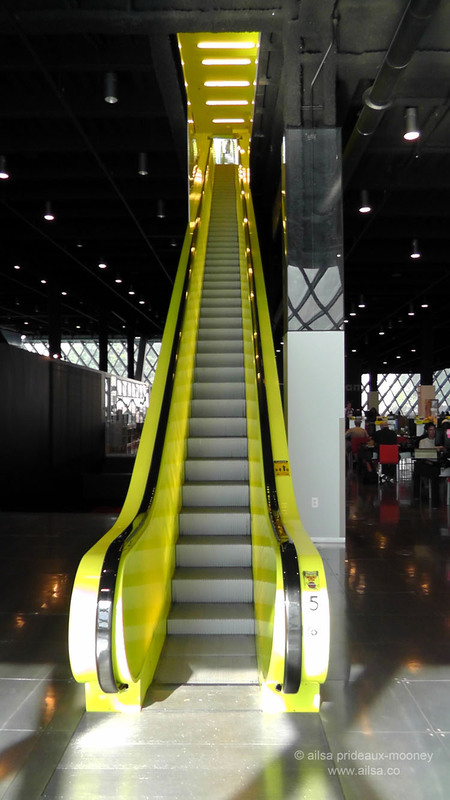 The last escalator is a one-way affair bringing you to the upper level past glass walls of books and finally emerging under a vast ceiling of glass, steel and upholstery. I could spend hours here capturing the beauty of these spaces and the vistas they frame. 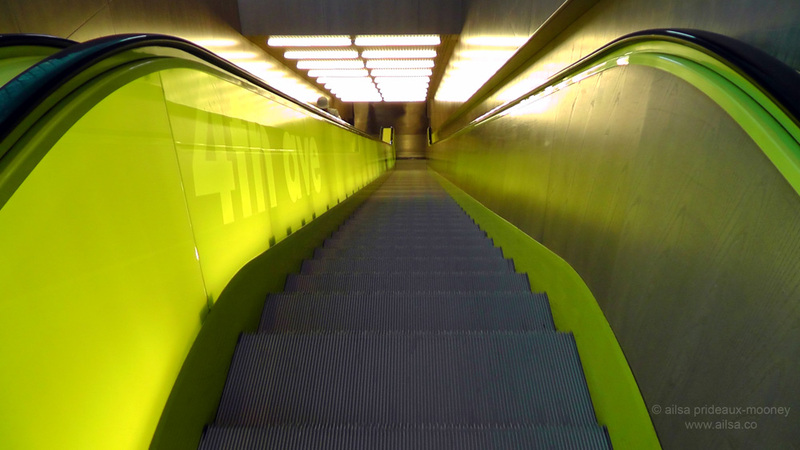 On the way down, you have two options – walk down through the books spiral or take the elevator. 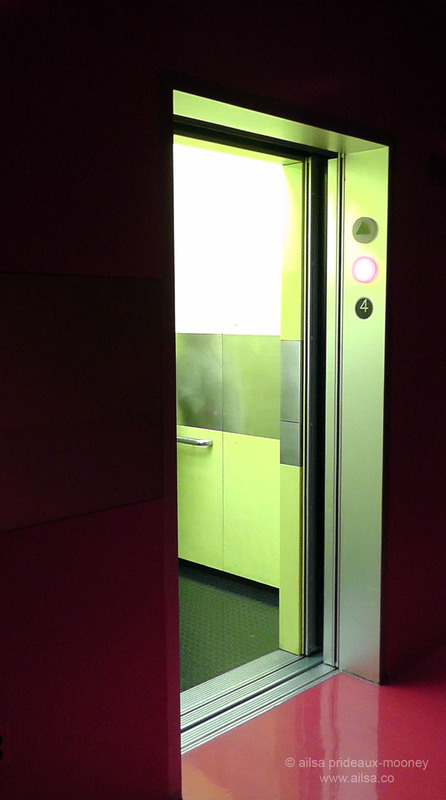 If you go for the latter option, be prepared for yet another splash of colour and make sure to press the button for floor 4. 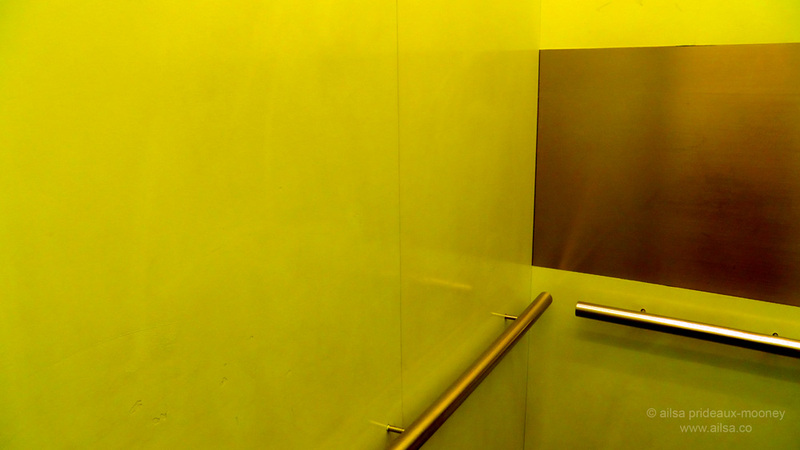 The elevator encloses you in a symphony of chartreuse and chrome…. 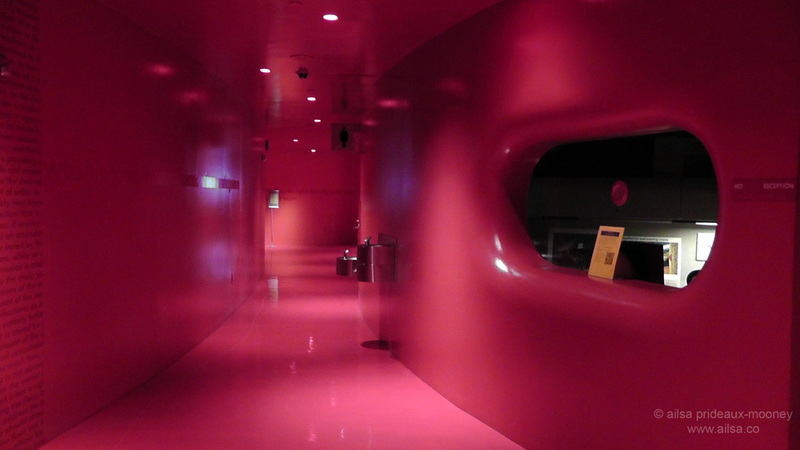 … and then bursts into a startling sea of red as you tumble out onto the fourth floor. 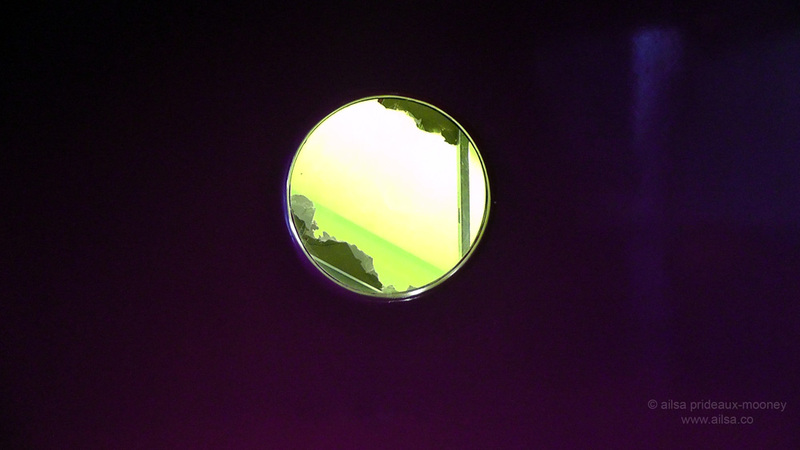 Wind your way along crimson hallways and lipstick red staircases until you happen across a small hole in the wall. 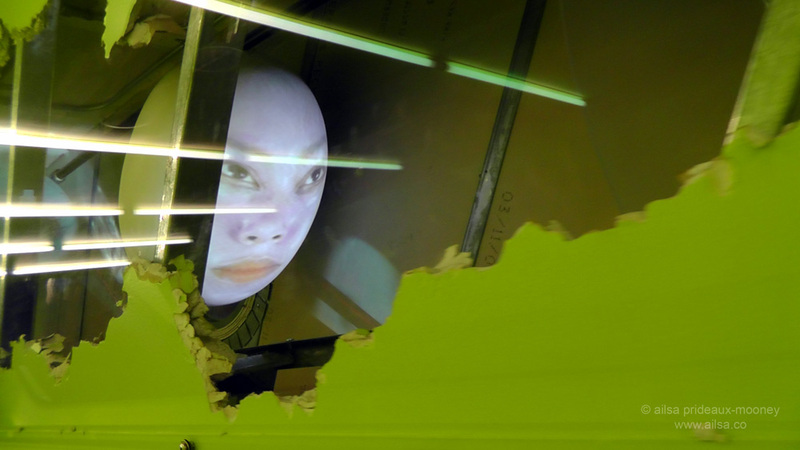 Look through that hole in the wall and find yourself cast as a living part of Tony Oursler’s Braincast sculpture. If you cannot make the trip yourself, don’t despair. 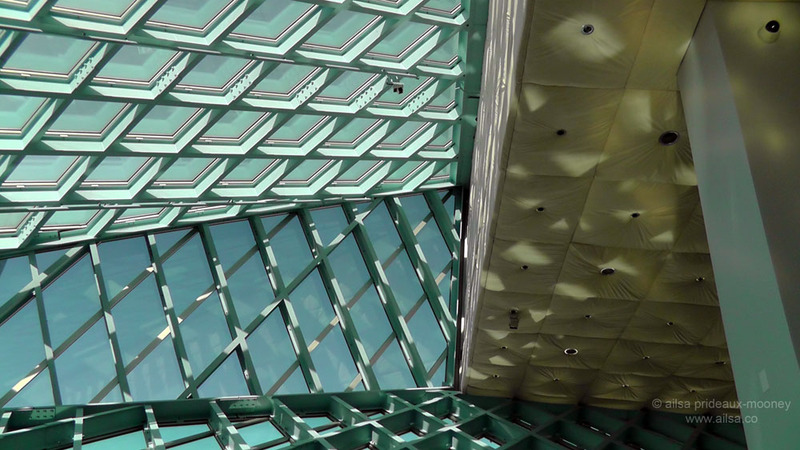 Here are a few video highlights of my trip through the library last week, so you can join in this architectural adventure. 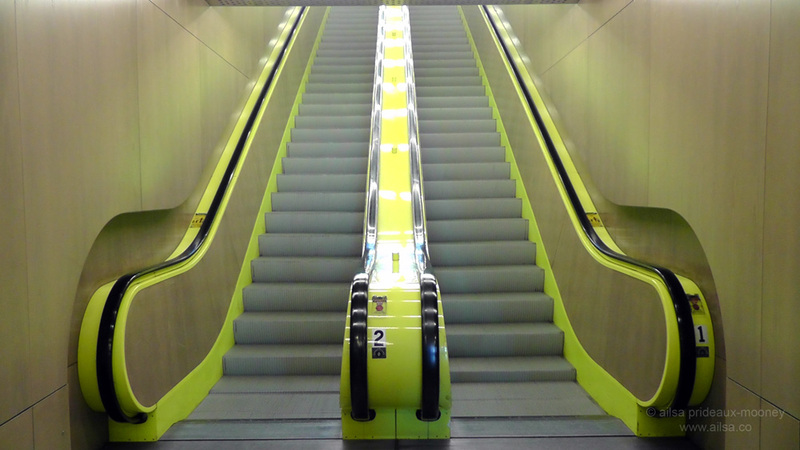 I’m going for one more trip on the yellow escalator, it’s just too much fun. 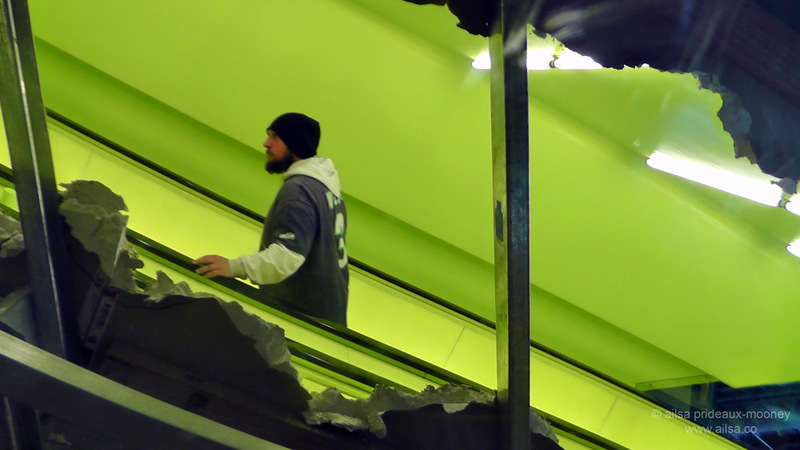 This entry was posted in Photography, Travel, United States, Washington and tagged architecture, art, photography, pictures, postaday, travel, writing. Bookmark the permalink. I never knew the library was so wacky and fun! I will definitely visit the next time I m in Seattle. HI Ailsa i definitely will! I linked to this post this week. Your photos are great. 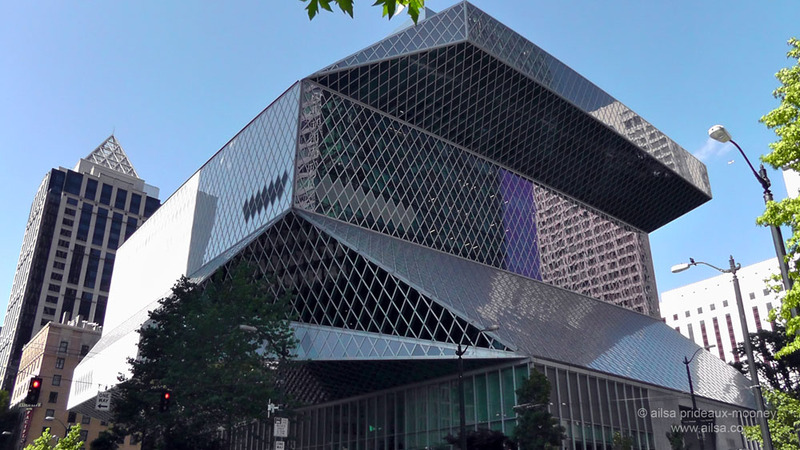 While I am fiercely loyal to Portland’s Central Library, I have to admit this one is pretty fantastic too. Good overview! 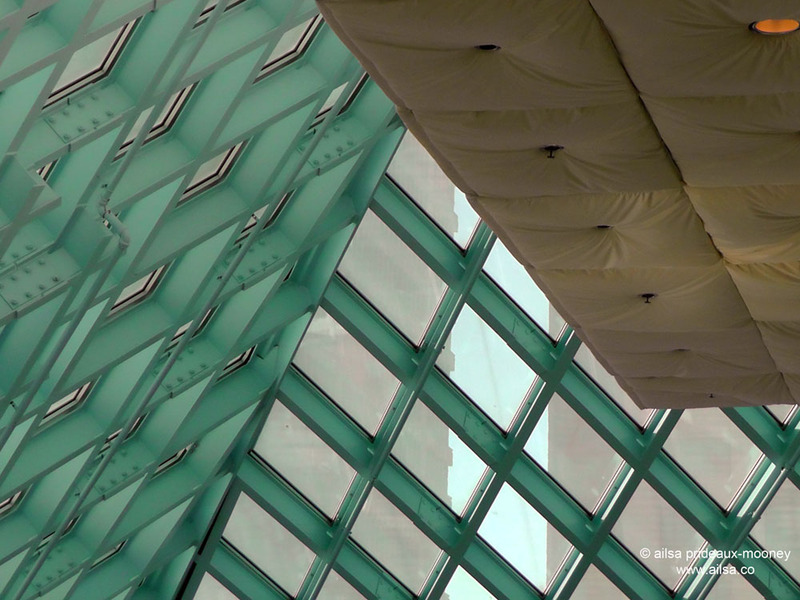 Pingback: Travel theme: Architecture | Where's my backpack? I have to agree – where are the books? Ahh, that’s because I was focusing on the design rather than the function. I should do another post on the functionality because their book collection and the layout, in an innovative book spiral that allows for the books to be displayed without a break in the Dewey Decimal System, is wonderful. It would have made for a very long post, however, so perhaps it’s best broken up into two separate posts. 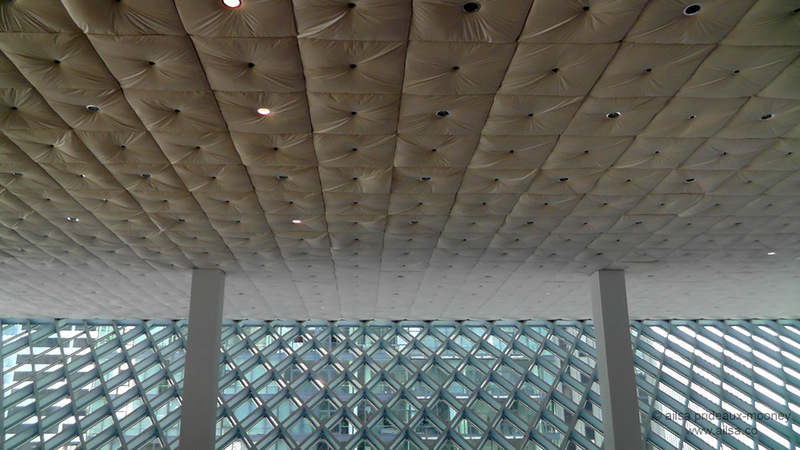 What a good idea to explore the library function of this building. However, architecture comes from function. ‘Form follows Function’ a phrase which became the foundation of Modernism and gave rise to the careers of the greatest architects of the twentieth century. Another principle of Modernism is ‘ornament is crime’…. While i dont entirely support the latter, floors, decoration, lighting and escalators are not architecture; they are ornament therefore interior design. Does this building, when you view it from the outside, tell you anything about its function? I love this. What a wonderful building and a wonderful space. It gives me yet another reason to visit Seattle and the Pacific Northwest. That is one of the neatest buildings! It’s funny how you’d never envision a library to be so modern. The floors in the entryway might be my favorite part, though. Very meaningful. Thanks! Definitely going on my list of places to visit in Seattle! You will have a fantastic time exploring this building when you visit, Sarah Ann! One of my very favorite places in the city where I grew up! Can I tell you how sad this post made me? BIG SIGH….somehow I missed this gorgeous place on my trip this year. Who knows if I will make it back…but thank you SO much for sharing it with us! Gorgeous pictures. Ah, but on the bright side, it gives you a fantastic reason to return! Very fun pictures and video with great dancetrack! It almost seems like an amusement park! Thanks for the fun cyber tour. It’s a well designed modern library! Beautiful photos! Great photos. Thanks for the tour. This place is unbelievable! I would be spending an awful lot of time, if I were there. Not only for the books, but this is a photographer’s delight! 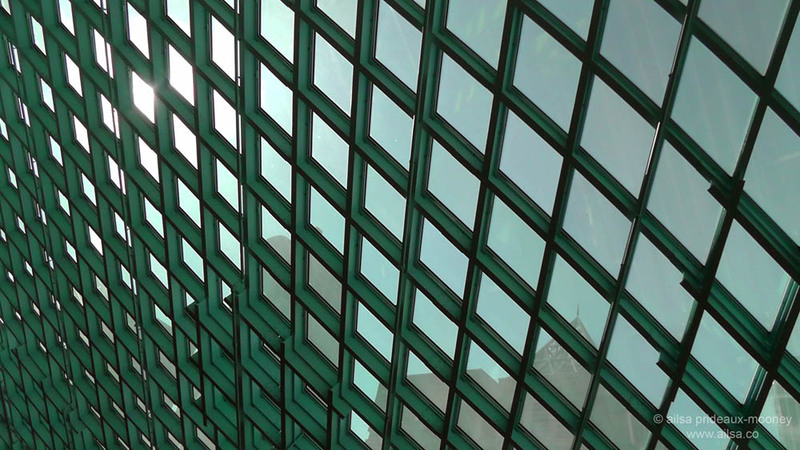 Dang, we’re going to Seattle next week – well, the Seattle area. This is the first time we won’t be in town and looking for things to do! I so want to go to this library! Thank you for posting these wonderful shots. Wow, what great visions of the world you give here – fantastic. I love that place. I have never found a book I’ve been looking for, because I keep getting distracted and end up having to ask how to find an exit. . .